For many years, Zimbabwe’s reputation as a travel destination has been tainted by the specter of political unrest. However, the country is more stable now than it has been for decades, and slowly, tourism is returning. Most of Zimbabwe’s top attractions are found outside the main cities, and are therefore considered relatively safe. Those that decide to visit can expect breathtaking nature areas, exotic wildlife and ancient sites that offer a fascinating insight into the continent’s history. Best of all, Zimbabwe’s world-class game reserves and UNESCO World Heritage Sites remain incredibly uncrowded — giving you the truly thrilling sense of having stepped off the map. Here are 10 of the best places to visit on your Zimbabwe adventure. Located to the west of the country on the border with Botswana, Hwange National Park is the oldest and largest of Zimbabwe’s game reserves. It covers a vast expanse of around 5,655 square miles/14,650 square kilometers and provides a refuge for over 100 species of mammal - including the Big Five. It is most famous for its elephants — in fact, the Hwange elephant population is thought to be one of the largest in the world. The park is also home to some of Africa’s rarest safari animals, including the African wild dog, the brown hyena and the critically endangered black rhino. Birdlife is abundant here, with over 400 species recorded within the park. Accommodation in Hwange National Park ranges from luxury lodges located in their own private concessions, to rustic camps that offer the chance to spend a night under canvas in the heart of the African bush. In Zimbabwe’s far west corner, the Zambezi River marks the border with Zambia. At Victoria Falls, it plunges off a precipice measuring 354 feet/108 meters in height and 5,604 feet/1,708 meters in width. This is the largest sheet of falling water on the planet, and one of the Seven Natural Wonders of the World. In peak flood season (February to May), the spray thrown up by the plunging water can be seen from 30 miles/48 kilometers away. 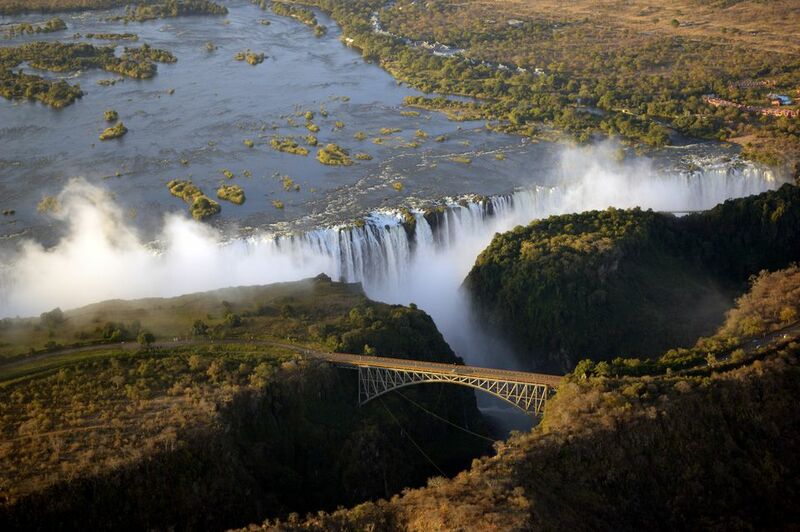 This magnificent spectacle gives the falls its indigenous name — Mosi-oa-Tunya, or "The Smoke That Thunders". On the Zimbabwean side, a path winds its way along the edge of the gorge. Viewpoints offer breathtaking panoramas of the plummeting water and the rainbows that hang suspended above the chasm. The sound is deafening and the spray soaks to the skin - but the spectacle is one that can never be forgotten. Northeast of Victoria Falls, the Zambezi River feeds into Lake Kariba, another superlative body of water located on the Zambian border. Created after the construction of the Kariba Dam in 1959, Lake Kariba is the world’s largest man-made lake in terms of volume. It stretches for over 140 miles/220 kilometers in length, and measures 25 miles/40 kilometers across at its widest point. There are several lodges located along the lake shores, but the traditional way to explore is on a houseboat. Kariba is renowned as one of the best places in the world to catch tiger fish, a ferocious freshwater species prized by sport fishermen for its strength and tenacity. The lake’s islands also offer ample opportunities for game viewing. Perhaps the most rewarding wildlife area is Matusadona National Park, located on Kariba’s southern shore. Mana Pools National Park is located in the far north of the country, and is renowned as one of the most pristine nature areas in Zimbabwe. It is recognized as a UNESCO World Heritage Site for its incredible concentrations of wildlife, including elephant, buffalo, leopard and cheetah. Mana Pools is also a haven for water-based wildlife, with large populations of hippo and Nile crocodile. They live in the four pools that give the park its name, each one created by the Zambezi River before it altered its course to flow northward. The largest of these is approximately 3.7 miles/6 kilometers long and provides a valuable source of water even in the height of the dry season. The abundance of water makes this park a prime spot for birders, too. It’s also the best destination in the country for walking safaris and self-sufficient camping trips. If you find yourself craving urban culture, pay a visit to Bulawayo, Zimbabwe’s second-largest city (after the capital, Harare). Founded in the mid 19th-century by Ndebele king Lobhengula, the city came under the rule of the British South Africa Company during the Matebele War. As a result, much of the city’s present-day architecture dates back to the colonial era, and walking through the wide, jacaranda-lined streets feels a lot like stepping back in time. Top attractions in Bulawayo include the Natural History Museum, home of taxidermied safari animals and rarities including a dodo egg and a prehistoric coelacanth fish. It is possible to encounter living African animals at Chipangali Widlife Orphanage, located a short drive southeast of the city. Medieval replica Nesbitt Castle adds to Bulawayo’s atmosphere of eccentric history and doubles as a boutique hotel. A four-hour drive south of Harare or east of Bulawayo will take you to the Great Zimbabwe National Monument, another UNESCO World Heritage Site. The site protects the remains of Great Zimbabwe, the capital of the historic Kingdom of Zimbabwe and the most important stone ruins south of the Sahara. Built between the 11th and 15th centuries, the ruins cover a vast area and include a hilltop acropolis that would once have housed kings and chiefs. The surrounding valley is littered with the ruins of more humble dwellings, all of which were built using granite blocks cut so perfectly that no mortar was needed to hold them together. Artifacts including Arab coins from the East African coast and porcelain from China have been discovered here, suggesting that Great Zimbabwe was once a wealthy and powerful center of trade. Matobo National Park is located 25 miles/40 kilometers south of Bulawayo. The park’s name means “Bald Heads” in the local Ndebele language — a moniker that refers to its fascinating granite rock formations. Some of these rocks are impossibly balanced on top of one another, and many of them are marked with ancient rock art created by the San bushmen some 2,000 years ago. Cecil Rhodes, the controversial 19th-century imperialist, chose to be buried here, and his remains are marked by a brass plaque perched atop World’s View, the park’s most iconic viewpoint. Matobo National Park is a top destination for hikers and those hoping to see white and black rhino. Although there are no lion or elephant, it has one of the largest leopard populations in Southern Africa and is a great place to spot Verreaux’s eagles. On the eastern border with Mozambique, mountainous Chimanimani National Park is a place of stunning natural beauty. The perfect destination for those wishing to hike, camp and lose themselves in the Zimbabwean wilderness, the park is defined by plunging gorges, lush valleys and soaring peaks. The highest summits reach over 7,990 feet/2,400 meters. The lower reaches of the park are covered by dense virgin forest, which in turn provides shelter for elusive wildlife including eland, sable and blue duiker antelope. Leopard roam free in the Chimanimani mountains and the birdlife is spectacular. This is also a good place to keep an eye out for Southern Africa’s smaller cat species. Amenities in the park include unpaved hiking trails, communal huts and a campsite with basic cooking and ablution facilities. Wild camping is also allowed throughout the park. Also located in the far east of the country, Mutare is Zimbabwe's fourth-largest city; yet has a laid-back atmosphere inspired by its scenic highland setting. It's known for its charming guesthouses and B&Bs, including popular budget option Ann Bruce Backpackers. Old-fashioned Mutare Museum is a must-visit for transport enthusiasts with a notable collection of vintage cars, motorbikes and steam engines. For nature lovers, Bvumba Botanical Reserve promises breathtaking views and walkways that give you the chance to look out for rare fauna including the Swynnerton's Robin and the endemic Samango monkey. For many people, Mutare's greatest worth is as a base for exploring the Bvumba Mountains or nearby Nyanga National Park. Overlanders appreciate its location a few minutes' drive from the Mozambique border post. North central Zimbabwe is home to the mysterious Chinhoyi Caves. A subterranean system of limestone and dolomite caverns and tunnels, the caves are protected as park of Chinhoyi Caves National Park. Pottery and human remains uncovered here suggest that they have been inhabited since at least the 1st century. Most famously, they provided a refuge from raiding tribes for Mashona chief Chinhoyi and his people. The top attraction is the Wonder Hole, a collapsed cavern with sheer walls that drop into the crystalline Sleeping Pool. The glacial blue color of the lake's water makes for impressive photographs, and from here, visitors can enter the illuminated Dark Cave. Chinhoyi is a popular destination for technical scuba divers. Excursions can be arranged through Harare-based dive center Scubaworld & Universal Adventures.